You are browsing the archive for Escuela de Datos. This article was originally posted in Spanish at Escuela de Datos by Phi Requiem, School of Data fellow in Mexico. Team Cero Riesgos: Generating information on risks by area. Data: OIJ, Poder Judicial. Team Accesa: Comparing the perception of Latin American citizens on current topics in the LatinoBarometer with the commitments and achievements per country. The goal: to know if governments are responding to citizen concerns. Team E’dawokka: Comparing the agendas and priorities of Central America with those in the rest of Latin America. Team InfografiaFeliz: What countries look like in the Human Development Index in terms of their anti-corruption measures (and their success). Team Bluffers: Measuring the percentage of delay and achievement of the commitments acquired by each country, and relating the design process for the commitments (measured by their relevance and potential impact) and their achievement. It’s difficult to explain the difference between a hackathon and a data expedition… But, the earlier this is out of the way, the better. There most be a conceptual baseline. With such limited time it’s difficult to give introductions or previous workshops, but trying to do a bit of this can be really useful. Teams always have good ideas to handle information and show conclusions, but many times impose limitations on themselves because they think the technical barriers are huge. Having a hackpad or Drive folder with examples and lists of tools can help people overcome that fear. [Cross-posted from Escuela de Datos. (Written by Sergio Araiza, data trainer at SocialTIC, for Escuela de Datos)] (English Translation to follow) Hace un par de semanas, SocialTIC y Escuela de Datos literalmente cruzaron océanos para llegar a Filipinas y, junto con Anders Petersen, habilitar el entrenamiento sobre manejo de datos organizado por el gobierno filipino, Banco Mundial y OKFN. La capacitación estaba planeada para diferentes grupos de usuarios como periodistas, organizaciones de la sociedad civil y personal del gobierno de distintas dependencias. Las diferencias en el grado de uso de datos fueron una constante durante todas las sesiones. A todo esto viene una serie de reflexiones sobre los entrenamientos y actividades que se debe hacer para garantizar que los usuarios con poco contexto sobre manejo de datos puedan tener una experiencia valiosa y positiva que les motive a, en un futuro, seguir adelante con proyectos de datos. Para quienes pertenecemos al área técnica, es común trabajar con datos de distintas maneras y, por tanto, es una actividad de la vida diaria. Quienes no provienen de esas disciplinas encuentran que manejar datos puede ser una tarea de dimensiones titánicas (y, por tanto, “imposible” para el juicio de algunos). Transmitir confianza a los asistentes de cada sesión era la tarea principal, más allá de la transmisión de habilidades técnicas que pueden absorber en unas horas. Si bien uno de los objetivos era generar las capacidades para la manipulación de la información, en el fondo siempre será valioso para todos los participantes poder sentir que, aunque las bases de datos pueden ser de cientos o miles de registros, manipularlas no es un reto si se tiene conciencia de los pasos a seguir. Conoce sus necesidades Cada grupo de trabajo es diferente y, por lo tanto, sus necesidades cambian. No es el mismo interés el de un activista que usa datos para generar incidencia o demostrar las causas de una problemática que un periodista que busca una nota con alto valor informativo para su público. Incluso el gobierno mismo es un consumidor de los datos, y en eso destaca la necesidad de las dependencias de usar información que no necesariamente se encuentra en los formatos más adecuados para hacerlo. Las audiencias cambian. Para eso se debe estar preparado en todo momento y siempre tener en mente qué es mejor en términos de herramientas para cada grupo. Esto permitirá que los asistentes tengan una experiencia más satisfactoria durante las actividades. Todas las tardes después de terminar las actividades, evaluaba junto con Anders qué había salido bien, qué no funcionó y qué debíamos preparar para la siguiente actividad. De igual manera, antes de iniciar las actividades por la mañana platicaba con los asistentes para preguntar qué tenían en mente que podrían aprender, y acercarme más a sus ideas con los ejemplos que yo usaba. Cada ejemplo que se manejó durante el taller tenía, entonces, un propósito. ¡No dejes una capacitación tan importante a la improvisación! Tener estos tres consejos en mente cuando prepares una capacitación datera te ayudará a crear un evento que permita ver que los datos no son difíciles de manejar, y que todos podemos aprender y enseñar. Recuerda: una sesión exitosa podría ser una gran bienvenida al emocionante mundo de los datos. ¿Has hecho capacitaciones similares, y tienes otros tips? ¡Nos encantaría compartirlos en el blog! Estamos en @EscuelaDeDatos y en Facebook. 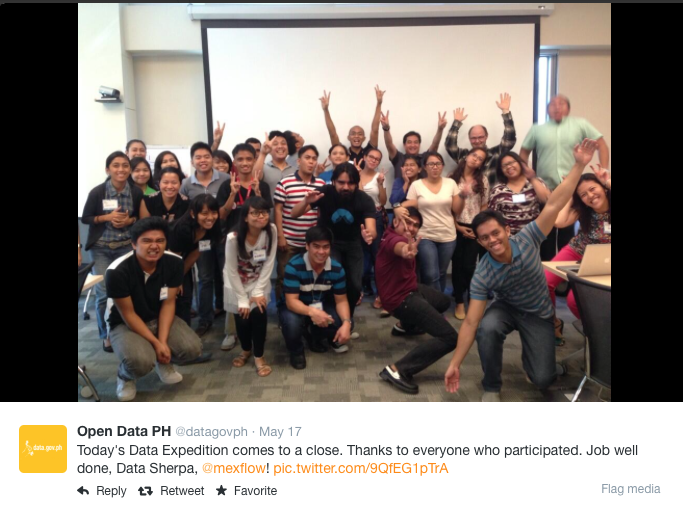 A couple of weeks ago, SocialTI and School of Data literally crossed oceans to go to the Philippines, and, along with Anders Petersen, participate in the data training organized by the Philippine government, the World Bank and OKFN. The training was planned for different types of data users such as journalists, NGOs and government workers. The differences in the extents to which they already did data analysis were visible in all sessions. After this experience, we want to share some reflections on trainings and the activities to ensure that users with little context in data analysis can still have a valuable and positive experience that will motivate them in their future to remain involved in data projects. For those of us in technical areas, it is common to work with data in different ways everyday. However, people from other areas may think that data analysis is an endeavor of titanic dimensions (and, therefore, an “impossible one”). The main mission, beyond the training in technical skills, is always to help participants feel confident in their abilities. Even though the “real” objective was to generate the capacities for data crunching, at the bottom, it will always be valuable for all participants to feel like manipulating databases won’t be an impossible challenge because they will have an awareness of the steps they can follow. All groups are different and, therefore, their needs are too. Activists may be interested in data use for incidence or for the understanding of social problems, whereas journalists may be looking for material for highly informative articles. Even the government is a consumer of data that isn’t always in the most adequate formats. Audiences vary. This is why you have to be mindful at all times of sets of tools that may be especially relevant to each of them. This will allow participants to have a more satisfactory experience throughout the activities. At Escuela de Datos we collect stories on the use and appropriation of data-related projects in Latin America and Spain. Today, we share Boris Cuapio Morales’ story – he is the developer behind INEGI Fácil, a tool that allows the easy search of data offered in the not-very-user-friendly web service of Mexico’s National Statistics Institute. We thank Boris for his time and help for this interview, which was carried out at Data Meetup Puebla. This post was originally published in Spanish by Mariel García, community manager at Escuela de Datos. “When I was in university, I was always struck by the fact that media like The New York Times always linked to the websites of US-based information systems. 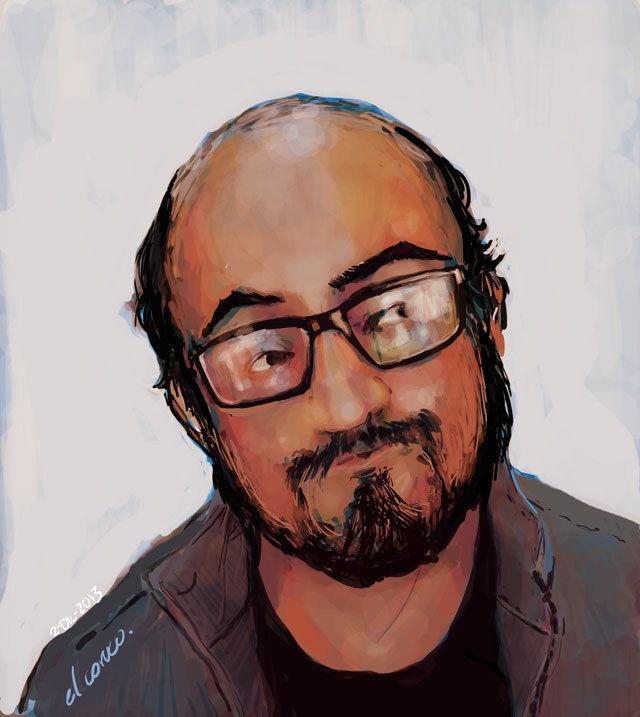 I always asked myself: why is it that we don’t have such systems in Mexico, too?” Boris Cuapio is an illustrator-turned-into-programmer that lives in Puebla, Mexico. In late 2012, he intended to use data from the National Statistics System (INEGI), and he found their web service. But he wasn’t qualified enough to use it. End of the story. That is, until late 2013. Boris had spent some time working for Canadian clients that requested products that incorporated the use of APIs of social networks like Twitter or Flickr, which forced him to learn what he needed in order to use the web service. His workmates encouraged him to start coding on his free time in order not to lose practice, and so he thought of a new project: to try and display INEGI data in an easier, more accessible way. That is how INEGI Fácil (Easy INEGI) was born. 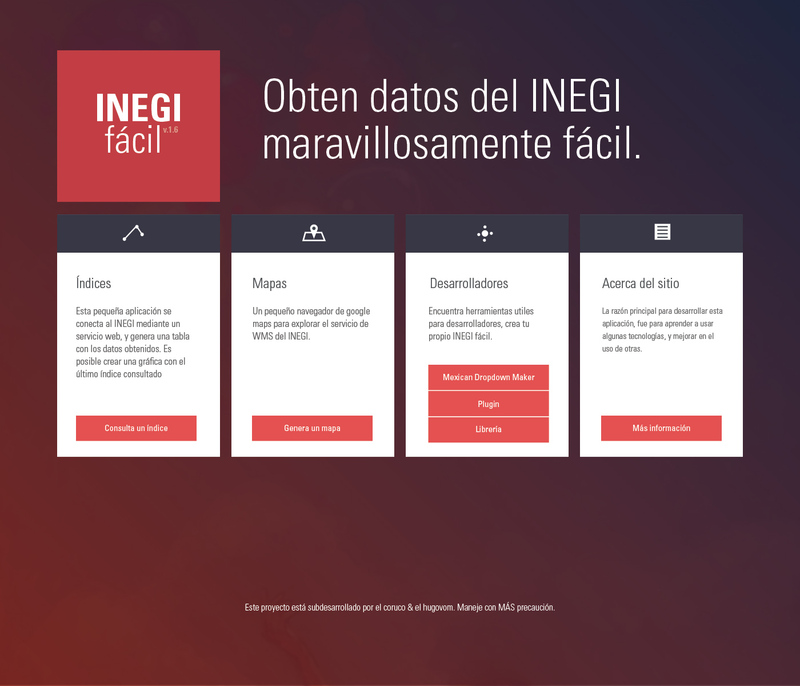 It is a website that queries the web service of inegi.gob.mx to show the results in tables and graphics. Is there value in the fact that a citizen, rather than the government, was behind this project? Boris thinks the speed of institutional processes would not allow the system to undertake the technological adoptions that are necessary in services of this sort. For example: while INEGI provides data in XML (a heavy format that has been gradually abandoned in other services), INEGI Fácil provides data in JSON, and with additional markers. INEGI has a tutorial that is rather difficult to grasp, whereas INEGI Fácil has a PHP library that makes the task simpler. Thanks to Hugo, the mastermind behind the design and interaction of the site. In reality, the government and Hugo are not competing. INEGI Fácil launched around July 2013, and in January 2014 Boris was contacted by someone at INEGI. In few words, they were surprised that someone was actually using the web service. When this service increases from its two current data sources to the hundred they expect to have, Boris will be a beta tester. This project has allowed him to learn a lot about JS, XML, PHP, databases, dataviz – how to make graphics, how to export data. And he likes this type of work; he wants it to stop being a hobby, and rather become his main project. He wants to sell this product to universities, which are the institutions that use INEGI data the most. But, meanwhile, he hopes all the indexes will be searchable by the end of this month, and that INEGI Fácil will soon be accessible from mobiles. In a year, if he can find financing, he would hope for INEGI Fácil to become a web service paralell to the one of INEGI itself; in other words, that it is used by media outlets through site embeds. His dream: he wants his own university to start doing information design, graphics, instructional catalogues, educational texts and other materials based on the data they can extract through INEGI Fácil. In Mexico, platforms based on open data are being developed. Do you know others in Latin America? We would love to share their stories at Escuela de Datos. En Escuela recopilamos historias de uso y apropiación de proyectos dateros en Latinoamérica y España. Hoy les compartimos la de Boris Cuapio Morales, creador de INEGI Fácil – una herramienta que permite la búsqueda de datos del web service del Instituto Nacional de Estadística y Geografía en México. Agradecemos a Boris la disposición para esta entrevista, que fue llevada a cabo en Data Meetup Puebla. Este post fue publicado originalmente por Mariel García, community manager de Escuela de Datos. “En la universidad, me llamaba la atención que las notas en medios como The New York Times siempre se enlazaba a páginas web de sistemas de información de EEUU. Entonces yo me preguntaba: ¿Por qué no hay en México sistemas así?” Boris Cuapio es un ilustrador-convertido-en-programador que vive en Puebla, México. A finales de 2012, él tenía la intención de usar información del INEGI, y encontró el servicio web… pero no tenía la capacidad para usarlo. Fin de la historia. …Hasta finales de 2013. Boris estuvo trabajando para clientes en Canadá, que pedían productos que incorporaban el uso de APIs de redes sociales como Twitter o Flickr, lo cual le capacitó para usar el servicio web. Sus compañeros de trabajo le recomendaron comenzar proyectos de programación personales para no perder práctica, él pensó en uno: tratar de mostrar los datos del INEGI de una manera más fácil y más accesible. Así nació INEGI Fácil, un portal que hace consultas al servicio web de inegi.gob.mx, y muestra los resultados en tablas y gráficas. ¿Pero por qué hay valor en que esto lo haga un ciudadano, y no el gobierno en sí? Boris piensa que la velocidad de los procesos institucionales no permitiría las adopciones tecnológicas que son necesarias en servicios de este tipo. Por ejemplo: mientras INEGI provee datos en XML (formato pesado que se ha ido abandonando en otros servicios), INEGI Fácil ya los da en JSON, y con marcadores adicionales. INEGI tiene un tutorial un tanto difícil de acceder, mientras que INEGI Fácil tiene una librería PHP que simplifica el trabajo. En términos de experiencia de usuario, no hay comparación (gracias a Hugo, la mente maestra detrás de los temas de diseño e interacción del sitio). En realidad, el gobierno y él no son competencia. INEGI Fácil inició cerca de julio de 2013, y en enero de 2013 Boris fue contactado una persona en el INEGI. En pocas palabras, les sorprendió que alguien de hecho usara los servicios web! Cuando el sitio pase de sus dos fuentes actuales de información a las cien planeadas, él será un beta tester. El proyecto le ha permitido aprender mucho sobre JS, XML, PHP, bases de datos, dataviz – cómo hacer gráficas, cómo exportar datos. Y le gusta ese trabajo; quiere que ya no sea un hobby, sino su proyecto principal. Quiere vender el producto a universidades, porque es donde más se utiliza los datos del INEGI. Pero, por lo pronto, espera que en este mes los índices ya sean buscables y se pueda acceder a INEGI Fácil desde celulares. En un año, si consigue dinero, esperaría que se convierta un servicio web paralelo al INEGI; es decir, que lo utilicen medios de comunicación a través de embeds. Su ideal: le gustaría que en su universidad hagan diseño de información, gráficas, catálogos instructivos, textos educativos, y que aprovechen INEGI Fácil. Tip datero de Boris (que, según él, le da a todo mundo, y nadie ha seguido) – “Junta tu dinero y contrata SafariBooks. Con eso puedes aprender lo que sea”. En México se desarrolla plataformas basadas en datos abiertos. ¿Conoces otras en Latinoamérica? Nos encantará difundir sus historias en Escuela.